In a previous job, everyday when I arrived to work it was Christmas. Literally the showroom always had a Christmas section, there was no 'off season'. 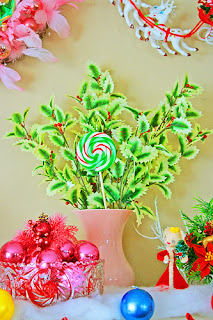 During that phase, I purchased a lot of cheap ornaments and baubles for decorating the house. This year, due to some personal shifts and generalized busy-ness, I'm not doing a full-sized Christmas tree. That means my collection of red, white and silver do-dads is staying in the storage unit and I'm only "putting up" my mini Barbie themed tree. It's about 2 feet tall and is decorated with mini disco balls and vintage Barbie doll ornaments. Each year Hallmark releases two different collectible ornaments, the yearly release, which is usually in a horridly large and gross princess dress, and then a historically popular Barbie from the archives. It's those ones I love best. My mom usually buys me one on Boxing day for half price, that's how I started collecting them! I've got a great series of them and it's almost as much fun unpacking them and putting them on my mini tree as it was playing with Barbies as a kid. 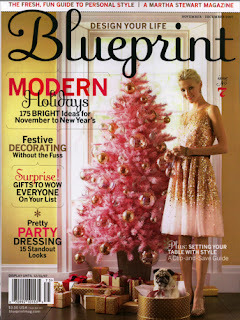 This post is about the pink Barbie tree being the centrepiece of my holiday decor this year, and how it's gotten me to thinking about different holiday colour schemes. 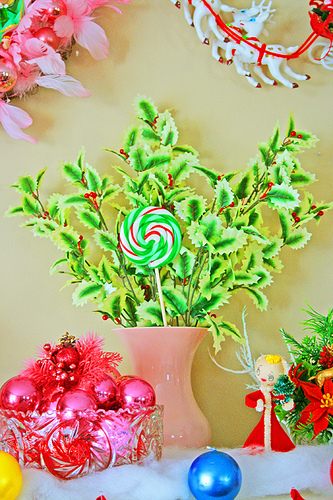 The traditional colours of green and red have a long history, and though many theories about why they are the Christmas colours are out there, it's likely because of the use of "Paradise Trees" used in Miracle Plays which were popular in the 15th Century. The plays were used to tell the story of Adam and Eve, and the trees were often pine trees decorated with apples. 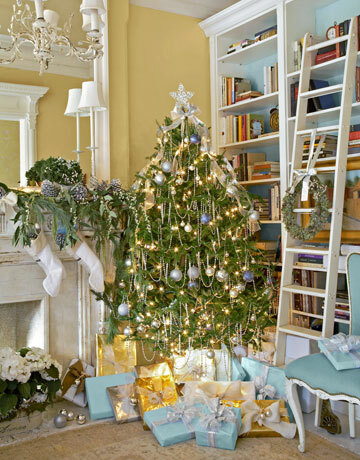 Evergreens were used because they could be sourced year 'round and kept their lustrous green colour. Non-traditional colour palettes are so pretty though! Using non-traditional colours isn't really new either, as evidenced by those lovely vintage glass ornaments finding themselves desirable again. 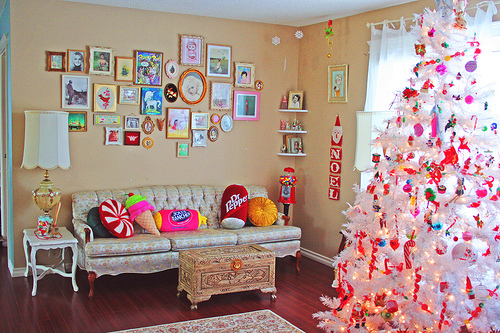 To me the best way to do a non-traditional holiday theme is to include one traditional colour and then go wild from there. Designers use this rule as well, because the traditional colours always sell better than the wild ones at retail. For this reason, collections have a 'safe' base colour and this helps them sell the more wild, contemporary looks. 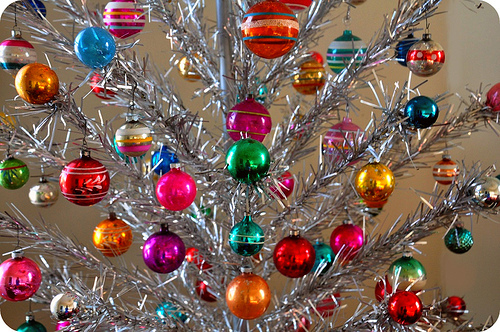 Use Silver, Gold, Red or Green or White and then have some fun. In my case, I'm using pink and silver! 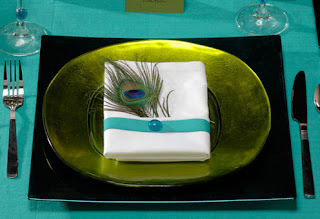 The hottest trend in decor, fashion and jewellery is definitely still Peacock. 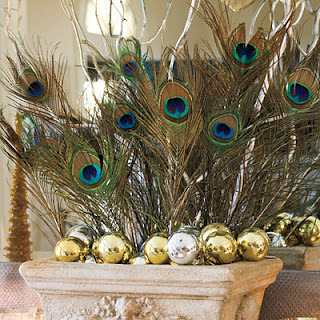 A holiday peacock theme uses green, and in this image also uses gold and silver. 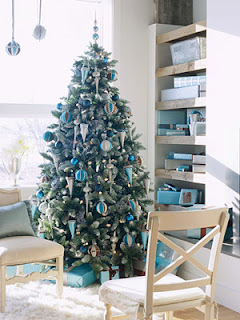 With a mix of lovely teal, purple, copper and brown ornaments it creates a lively, warm glow at the holidays. When you tire of the peacock look in a few years, you are left with gold and silver accents for use in a new theme. If you use the bright green tone, like in the place setting below, this paired with rich gold or copper is a more traditional spin on the palette. Also popular this year is Tiffany Blue. Mixed with white and silver, it creates a pretty, glam holiday look. 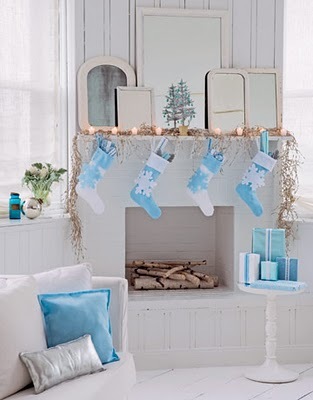 Reminiscent of snowfall, icicles and jack frost, blue works in the home throughout the season and is perfect if you are planning a new year's eve party as well. The white and silver elements can be used year after year if you tire of the blue touches. Clear beads and crystals, your plain glass vases and pinecones spray-painted white and silver are affordable ways to add a little oomph to a few blue purchases without breaking the bank. 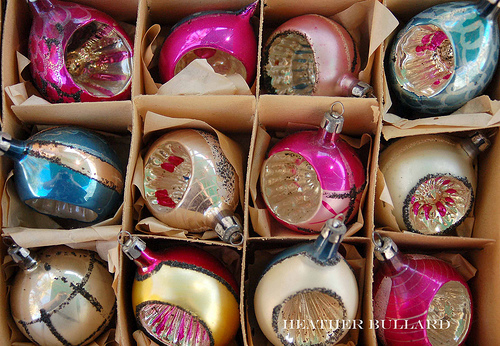 Coming back to those lovely vintage ornaments, the third holiday non-traditional colour trend I adore is saturated brights like pink, chartreuse, hot red, orange, bright blues. These looks often feature stripes and polka dots and are over-the-top whimsical. And I say if you can't be over-the-top whimsical at Christmas, when can you be? 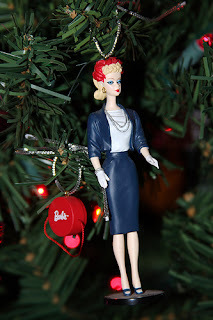 Vintage ornaments, plastic holly, hot pink? Kitsch done right! I love the little plastic elves, feathers and jolly snowmen. It's so child-like and fun and playful, and is definitely affordable since you can mix and match vintage and dollar store finds easily with this look. I also recommend hitting after-season sales if you're into pink, because it is typically the worst-selling holiday ornament colour, so they boxes are usually left on store shelves on deep discount. What colours do you love at the holidays? Are you loyal to tradition or do you like to mix it up? 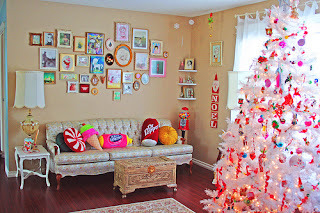 Do you decorate to match your home decor or have your gotten your orns as hand-me-downs? This year I'm adding to my decor with some new affordable silver accents like tinsel and silver icicles, just to shake things up. And I'm keeping my pink tree front and centre. I feel like it's time to have a break from tradition.